Hillary wasn't first. Nor was Ferraro. Have you heard of Belva Lockwood? I had not either before reading this fabulous picture book biography. Belva once read that a person could move mountains if he or she only had faith. Belva believed this wholeheartedly, and lived her life accordingly. Belva was born in Niagara County, New York in the year 1830. She was the daughter of a farmer, and by the time she was a 39 she had already been married, had a child, been widowed, become a teacher and gotten involved in the suffrage movement. She decided that she wanted to attend law school. In 1869, however, not many law schools wanted to admit women, and the few that did certainly did not want to grant degrees to the women who attended. If you've figured anything out about Belva by now, you know that she found a way to get her deserved degree, and to have it signed by President Ulysses S. Grant to boot! What could be next for Belva? After becoming the first woman to graduate from the National University Law School, she became the first woman to practice law in the federal courts. She was the first woman to argue a case before the Supreme Court. She rode her tricycle around Washington D.C. oblivious to the stares from those around her. And then in 1884, Belva became the first woman to officially run for president. 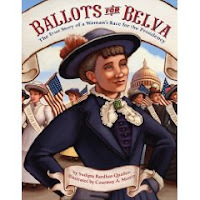 Before the ratification of the vote, Belva ran for president! And she got votes. Votes from men. 4711 to be exact. She got more votes than that, but they were thrown out, since the men doing the counting could not believe that anyone would actually vote for a woman. I found this story not only timely, but incredibly inspiring as well. An author's note, glossary and timeline are included, which make this ripe for classroom use. Do today's kids know that the vote was taken away from women in 1787 (1807 in the case of NJ)? Author Sudipta Bardhan-Quallen has done a great job of writing a readable storyline filled with, but not laden down by, facts surrounding suffrage and the political process. Courtney A. Martin's illustrations reflect the time period, though I do wish that the cat accompanying Belva everywhere was explained! This is a book that deserves a prominent place in classroom and library alike! Abigail Iris is NOT an only. This means that she shares a room, she can't get the Heelys that she wants, and her family exists on a budget. Her life is different than her 3 best friends who ALL happen to be onlies. Imagine how thrilled Abigail Iris is when one of her only friends, Genevieve, decides to take her on her family vacation for spring break. She is a bit worried that her parents might say no. Genevieve, who has lawyer parents, simply tells Abigail Iris to make her best case. And that's exactly how Abigail Iris ends up riding in Genevieve's dad's SUV (aka the gas hog)all the way to San Francisco. All the way to a fancy hotel "sweet" with room service. Abigail Iris will have to miss her own family's annual camping trip, but all of these things that families with an Only get to do will be worth it, right? In the spirit of Amber Brown and Clementine, Lisa Glatt an Suzanne Greenberg have created a fun and feisty character. Wanting what friends have is familiar to many a reader, and 3rd grader Abigail Iris has the perfect blend of pluck and wonder. This is an illustrated novel and the drawings by Joy Allen add flavor to the story. There is, however, one illustration that doesn't fit the text. Abigail Iris is talking about making a phone call on an old fashioned dial phone. Unfortunately, the phone in the illustration has very obvious push buttons! If you work with kids you will know that this will not go unnoticed! Since this is the arc version, perhaps it will be changed in the final product. That aside, this is a breezy read that will have younger realistic fiction fans passing it from hand to hand. Libby's life seems to be in the dumps. Not only did she set her own hair on fire during chemistry class, but her crush Seth seems to be flirting with her nemesis Angel Rodriguez. Add to this mix the fact that Libby has just discovered that her mom has had a secret boyfriend for the past 7 months now. His name just happens to be Manny Rodriguez. Angel's dad! Can you imagine? So what's a girl to do? Blog about it, of course. But in a private password protected blog that nobody would have access to, right? Well, nobody would have had access if her mom hadn't invited Angel and her dad over for dinner. What will happen when Libby's private blog is suddenly very public? All those thoughts about Seth? Her moaning about her best friend Keisha? Will Libby ever be able to get over the humiliation? Phoebe is a typical goth girl biding her time in high school. She hangs out with her best friend Margi, and Adam from next door has a crush on her. The thing is, the hallways in her high school have changed over the past few years. Oakvale High has become somewhat famous for its integration of living impaired kids. You know ... zombies, corpsicles, worm buffets...however you say it, one thing is sure. These kids are dead. The interesting thing is that only American teens are coming back from the dead, and not all dead kids return. Tommy Williams (living impaired, or differently biotic if you will) has managed to catch Phoebe's eye. She knows it's kind of cliche...the goth girl falling for the dead boy, but she cannot help herself. She's drawn to him. Not all of the kids in Phoebe's school feel the same way about the dead. Kids like Pete and TC from the football team don't think that the dead should mix with the living, and they plan on making sure that everyone who fraternizes with the zombies will pay. Daniel Waters has written a wry romance slash football story slash high school story that pushes our idea of normal. From the inevitable commercialization of zombie paraphernalia, to the idea of Phoebe and Tommy's relationship becoming physical, readers will find themselves grappling with the reality of their own actions. Think about it. What would you do if your little brother or sister came back from the dead? Would you open your arms or run? The storyline itself has the perfect blend of reality and sci/fi to crossover audiences, and the ending packs a punch. I think that guys and girls will like this book equally, and they will have a good time reading it! I do like stories of journeys to and from faith, so when I read the title Trespassers Will Be Baptized, I knew I wanted to know more. Elizabeth Emerson Hancock was growing up in Kentucky where her daddy was a Baptist Preacher. She herself was a deeply religious child who felt the call. In fact, during a block yard sale, Elizabeth and her sister Meg saw the other kids setting up lemonade stands and took matters into their own hands. They set up their own stand..."Baptisms: 25 Cents"! Hancock weaves humour into this story of growing up religious. She reminds us what it is to look at our parents with awe and then inevitably become disappointed in their choices. Readers move from the pulpit to Vacation Bible School, to mother-daughter retreats and back. We see the hypocrisy and the love in the church environment. The story is told anecdotally focusing primarily on Hancock's relationship with her father, sister and mother in turn. When I first picked this book up, I thought it might have a bit more of a Jesusland feel to it, but I was wrong. We simply follow Elizabeth (Em) and her family along the way. It is a description rather than an analysis. It is enjoyable, and gives a good look into the ways of the South and the way that her own family had a journey to faith both within the church and within the home.